As search evolves to favor natural language, is it worth your time to select and incorporate keywords in your web content? The question came up in a recent blogging presentation I was leading. My short answer ("yes") was met with some surprising resistance from other marketing folks. For small businesses, and particularly small local businesses with equally small marketing budgets, I understand a reluctance to spend a lot of money on keyword research. But spending more than a few minutes on it in the content development process is still important - even in 2019. Rather than allowing the discussion to devolve into a disagreement, I moved the presentation along with a soothing (and accurate) "of course you should always write with your reader in mind." But this is my blog so let me be clear: yes, keywords still matter in 2019. Small businesses can and certainly should spend the time necessary to use keywords and phrases (naturally, and in helpful content) in their marketing content. Auto Parts Warehouse provides an excellent example of how keywords (in this case, longtail keywords) can be used in truly useful blog content. 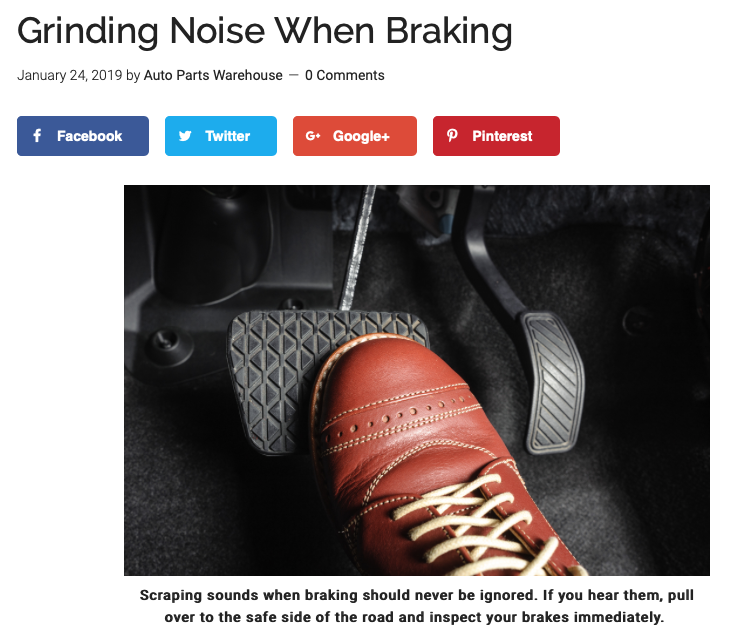 Headlines like "Where to Buy Wiper Blades" and "Grinding Noise When Braking" get the attention of humans and search engines alike. I'm willing to bet Auto Parts Warehouse puts more than a little bit of loose change into advertising, link building and other SEO endeavors, too. But let's focus on the humble human with squeaky breaks. See what Auto Parts Warehouse did there? It's the perfect trick - because it's not a trick. The human gets what the human wants: information on the web. The search engines reward Auto Parts Warehouse because the click delivers on those keyword promises. It meets the EAT guidelines in Google's 2018 Q3 update, providing Expertise, Authoritativeness, and Trustworthiness. Creating good content that's useful and establishes your business as an authority (thereby making people want to do business with you, and refer other customers to you) isn't rocket science, but it takes a little time and planning. If you know a blog could help grow your business, but don't have time to do it yourself, step on the brakes long enough to get in touch. I'd love to help drive your business forward. Want to learn more about Semantic Search? Search Engine Journal's article is a good place to start. Really big on DIY projects? You can learn how to create a natural language search for arbitrary objects with deep learning (in 5 easy steps) on Towards Data Science. Just need a copywriter who can reach your customers? I'm right here.